*Flashback Post~4/21/10: Making of the Band… Wedding Band, That Is! The romantic that my sweety is though began to pout at the idea of our rings not completely matching, and wanting them to be symbolic of our love and spiritual bond (he’s so girlie. heeheehee). Because of that, I felt guilty to not have identical styles, for exchanging vows (and claiming each other while others lust after us [haha]) so, had to call my friend who’s designing my ring to go back to the drawing board of figuring out how to get me my artsy, razzle-dazzle loop of love without going the traditional route. Genius! My friend suggested that I do the new, modern twist on wrapping an engagement ring by sandwiching the thing between two bands. 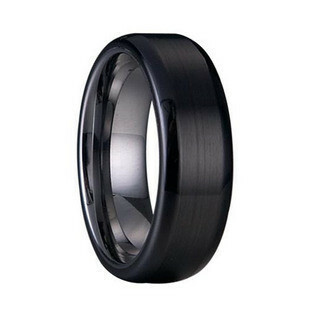 Instead, she’s going to make a scaffold setting that will sandwich my black wedding band between white gold or platinum that is sprinkled with black diamonds and has my sapphire on top… kind of like an Oreo cookie with extra stuff! >;} Hopefully, it’ll look cool and still give the illusion of one band (what I originally wanted). Speaking of sapphire, I was online shopping around for one in light-blue and came upon a website with a plethora of choices and a range of high prices to match. Then, it happened… I saw and clicked on the magical “Discount” link on their site and spotted all of these dubiously attractive stones that were under $100. I planned to spend much more for my loose gem so, this was a delightful surprise. They were all lovely, but I wondered what was “wrong” with them… or for a proper euphemism, what their “natural characteristics” had to offer. ©2010-2011 Heidi Rodney-Nakanishi and ChocolateGeisha Spills the Sake! All images are copyrighted by their respective authors. Previous *Flashback Post~4/21/10: Chance Meeting Turns into Wedding Plans! Next *Flashback Post~4/21/10: Psychic Wedding Officiant!